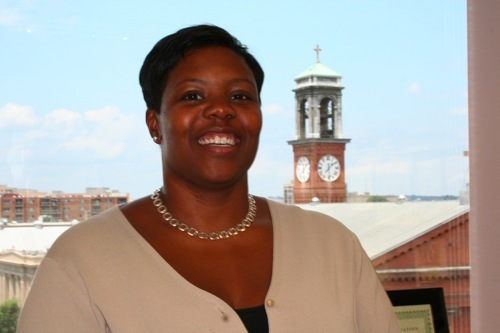 ﻿Yesterday afternoon, we had the chance to sit down with DCPS Interim Superintendent Kaya Henderson to talk about her new position within the school system, what she loves about DC, and what her goals are as the new interim superintendent of the city schools. You graduated from Georgetown, you have a bachelors in foreign service, in diplomacy if you will, when did you decide that Education was what you were looking for? Kaya: When I went to Georgetown, I thought like most folks in the school of foreign service, I wanted to change the world. The world being a big place, I had traveled a ton when I was growing up and I was fascinated by what was going on in lots of other places in the world. In the course of my four years, as my friends were headed off to farflung places to help other people, it became pretty clear to me that there was something weird about going to Latin America or Africa or Asia to help other people, I felt there were significant needs here. Kaya: I thought policy would be a good place for me to be and when I looked out at the things I was really interested in, Education was really the only policy area that I was concerned with. I had tutored a ton in high school and college, I did a lot of programs that involved young people, and so I wanted to go into education policy and that I couldn’t be a credible voice in ed policy if I hadn’t taught. Teach for America was a very new organization at the time, I was in the third group of folks to come into the organization and it ended up working very well for me. That experience of teaching middle school spanish in the south bronx, with kids who literally lived four miles away from where I grew up, but it might as well have been a world of difference. I grew up in Westchester County, and they grew up in South Bronx, it meant that our life outcomes were for the most part determined by our zip codes. I became so compelled around the idea of having great teachers in our most challenging environments that it set me on the path that has continued now for 18 years. It makes a big difference to come at it from a teaching perspective, as well as from the policy side of things. Did it make it easier for to deal with classrom teachers on a day to day basis? Kaya: Oh yes, I’ve walked a mile in those shoes, and I have some ideas about what they’re facing. Your first biggest challenge is going to be budget for the coming year. I know that budgets across the city are facing significant deficits, and what’s looking like significant cuts from the city council to try to deal with the underperforming revenue, how are things looking so far? Kaya: We haven’t started to go through the budget process yet. I’m optimistic. We’ve been fiscally prudent over the last three and a half years, I feel like we’ve had to make cuts before, and we’ve used the data we’ve had and the outcomes to really drive how we allocate our resources. I’m pretty confident that we’ll be able to trim where we need to trim and still deliver a high quality education to the students in the District. I’m not super worried about it. That’s gotta be a stressful process, with contract negotiations concluded and teacher salaries on the rise, it’s the last place you want to be to have to reduce staff as well, or to have to cut back in other ares. Kaya: Yes, but I feel that the team I have here, we’re disciplined, we try as best we possibly can to hold schools as harmless as possible. That doesn’t mean that schools are off-limits, but we really try to make the decisions so that it doesn’t cut to the bone. I’m confident we’ll be able to do that again. Looking at Special Education, I understand that’s a big priority for Democratic Nominee Vincent Gray, he wants to work on re-integrating a lot of those students into DCPS who’ve been elsewhere. What sort of strides is DCPS going to take under your interim leadership to accomplish that goal? Kaya: That goal has been shared by the Chancellor and by the Deputy Chancellor for Special Education, Dr. Richard Nyankori, and in fact Richard has advanced a plan to bring back non-public tuition students who are in schools where we’re paying non-public tuition and has already started to lay the foundation. I feel like it will be a continuation, I feel that having Chairman Gray’s attention on this issue will help us to drive it forward with more gusto, but we’re committed to doing it. We’re building capacity internally to serve those students. There’s a tiered approach to bringing these students back; we don’t think we can bring everybody back. It’s well underway, and we’re going to continue to pursue it aggressively. Is this a place where you’d like to stay longterm? Are you interested in this position after the interim period? Kaya: I feel like I have no clear idea just yet. I haven’t even taken on the job. At the time when it makes sense, I think the Chairman and I will sit down and figure out whether or not that’s the right thing for the District and we’ll go from there. Parental involvement is a huge part of any school reform efforts, it’s critical to have parents involved in the education of their children. Talk to me about how you’ll be reaching out to parents now, as part of this interim process, to engage more parents in the education of their kids. Kaya: I think that under Chancellor Rhee’s leadership, we have created a ton of vehicles for parents to be able to be involved in their students’ education, to keep them informed, to hear from them on their ideas and feedback, and I’m going to continue to pursue all of the avenues open to us. Town hall meetings, office hours, community forums, living rooms, the newsletters and notes that we put out, our website has the capacity to do that and I hope to be as accessible and as responsive as was the Chancellor to ensure that people know that they have a voice. I need them to also understand that it’s not just me, I’m not the only person, I have a talented team of folks. All are responsive, all are interested in community feedback. I’ve been here for 13 years, I feel like while we didn’t get a ton of credit for it, this administration has reached out more than others to parents and the community, and I hope to continue that and make people feel that. I know that one of the biggest complainst during Chancellor Rhee’s tenure were stylistic in tone, and there are people who feel they were not given the appropriate respect. Whether or not that’s true, perception has become reality in that space, do you feel there’s a deficit between the community and DCPS? Do you feel that’s an accurate portrayal? Kaya: I feel like “The Community” (with airquotes) is perhaps not the right term. There’s not a monolithic voice in DC, there are some people who are thrilled with how things are going, and there people who are frustrated with how things are going, and it’s incumbent upon us to insure that everybody at least feels heard. They may not agree with the decision that we ultimately make, and welcome to Leadership, and I think it’s important for people to feel like we’ve heard their concerns and have considered them as we move forward. One of our readers asked us about Van Ness Elementary in Near Southeast, it was closed in the round of closures in 2006, and there’s been a strong movement from parents in Near Southeast to get that reopened, is that something you guys are working on now? I know it’s early, I know you don’t take over for a couple weeks yet, but this was a concern of some of our readers. Kaya: I know it has been on the agenda of the folks who manage our school portfolio, and school closings process. I’m not up to speed on what the plans are for Van Ness, but I feel like I’ll spend the next two weeks with the Chancellor insuring that we’ll have a smooth transition. I’ve had the luxury of just focusing on human capital and so I have some work to do over the next couple of weeks. So you live in Ward 5? Kaya: I live in Brookland, near Howard Divinity School. What made you decide to live in Ward 5? Kaya: When I first moved back to DC, I had an apartment on Capitol Hill, which I loved, and it was great. I lived there for four years, and decided to look for a home to buy. I grew up in the Suburbs, in Mount Vernon, New York. I had a front yard, and a dog and a driveway, and those things were very important to me. As I looked around at neighborhoods, Brookland offered the kind of surburban living that I really like, but is still smack in the middle of the city, it’s the best of both worlds. I’m there and I love it. Do you miss New York? Do you prefer DC over New York these days? Kaya: I do. I feel like I have spent most of my adult life in DC. I love New York, I will always love New York, it’s where my people still are, but I feel like DC fits my personality a bit better. It’s a little slower, people are a bit nicer, the cost of living is a bit lower, and the opportunities to really be a part of the community are very different here than in New York, and that feels good to me. I remember when I first moved here, when I lived on the Hill, I was struck by how, I didn’t have a car at the time, and I rode the bus to work, and people on the bus said “Hello,” and my dry cleaner knew I had a job where I travelled a lot, and so, she put gum in the pockets of my suits, and said, “You need to chew gum on the airplanes, right?” It was just not because I was anybody, but just because that’s how it was. That has carried through, even more so, in Brookland. It fits who I am. Chancellor Rhee’s reforms have been significant in scope, from the front office to each individual classroom. What are your priorities going to be? Keep things moving, or go in a new direction? What are your goals for the first six months? Kaya: I think what’s fascinating to me is that people are like, “Well, Michelle did this, what are you going to do?” We’ve been a team. Many of the reforms are the reforms of this entire team, committed to and have been implemented. Many of the biggest reforms that we are noted for have come out of my shop, so, it’s not a different reform agenda. It’s a continued reform at the same pace and sense of urgency. When I think about my three priorities, moving forward, my immediate priorities are continuing the human capital work we have done. I am still convinced that having a great teacher in every single classroom, having an awesome principal at the helm of every school and having great central office people to support those front line folks is the greatest lever that we could pull to insure reform in the District. Another priority is ensuring that the Special Ed reform continues and that we can actually realize the savings and capacity building that we can expect to have happen by bringing who are in non-public [schools] back. Thirdly, implementing the Washington Teachers contract with fidelity. I think that we have a groundbreaking contract, and the world is watching what could happen. We have good will with the union, I sat at the table as our lead negotiator, and so we all, both sides, put in a lot to make this happen, and I think we can show the world what happens when you come to a good and groundbreaking contract. I am particularly interested in ensuring that is implemented well. The devil is in the details. Those are the three things that are front of mind for me as I take this roll on. Kaya: No problem. It’s been great talking with you. Waiting for responses from people who insisted that Michelle Rhee was the next coming of the Christ and no one else could do her job! Good luck from a fellow Hoya !!! The District of Columbia Public Schools (DCPS)community have lost a valuable component (Chancellor Rhee). Yes, I know she used the ax, but change had to come to D.C. Public School if their students plan to compete with the surrounding areas. Personally, I the United States Government should takeover DCPS. This means money will be poured into the system and they will recruit top-notch teachers. As the result, the children will be benefited. Also, DCPS needed a new educational look and Chancellor Rhee was creating its new look. I believe DCPS should be the leading school district in the area. The schools are close to the United States Treasury Office, White House, Monument, (all these high power places) and their students are the lowest on the educational status pole. Chancellor Rhee was on the right track and it is sad that people could not see her impeccable and cutting-edge vision for the school district. Pray for DCPS, just pray. Prayer will change anything, everytime!